Interestingly, this unregulated and technically incompetent industry sector has been exclusively entrusted to manufacture items, which pollute the most in processes like the garments, leather tanning, dyeing and electroplating. "The economic logic behind this kind of reservation is a fraud," says Shreekant Gupta, reader, Delhi School of Economics, University of Delhi. "The basic logic of this protectionist policy for SSIs was employment generation. But the environmental and social costs of this employment creation is also very high," he adds. Moreover, the prevailing ceiling on investment in machinery and fixed assets discourages SSI owners from investing in pollution control equipment. In India, the SSIs continue to get the benefits related to this sector as long as they continue to remain small. The government policy discourages them to move towards medium or large sector, where they can invest on the pollution control technologies and better resource utilisation. "It is common to find an entrepreneur owning 8-10 SSIs instead of one large industry," says Mahesh Vyas, executive director of the Centre for Monitoring Indian Economy in Mumbai. "There is an inbuilt policy bias towards deliberately staying small," says Bibek Debroy, director-research, Rajiv Gandhi Foundation, New Delhi. Taking advantage of the favourable policies and almost absent environmental policing even large industries dump their more polluting processes to the SSI sector to save investment in pollution control equipment. For example, the Centre for Science and Environment's Green Rating Project on the automobile sector found that more than 80 per cent (more than 15,000 components) of a single automobile was outsourced from the SSI sector. The Union government's attempts, though few and feeble, to clean the sector has failed. In the late 1990s, the Union ministry of environment and forests (MEF) in collaboration with the World Bank launched a project for waste minimisation among SSIs. Forty-five waste minimisation circles were set up in various sectors in different parts of the country. But mostly these projects largely remain restricted to demonstrations and pilot projects and have achieved partial success. Out of the 300 waste minimisation options identified, only 120 have been implemented. A recent project in the town of Tirupur, Tamil Nadu, failed to take off, as the industrialists showed little interest. The government's focus then shifted to common effluent treatment plants (CETPs). In the early 1990s, CETPs were touted as the magical solution to pollution from SSIs. The idea was novel: SSIs could come together and collect their wastes and treat at a common treatment facility. This would reduce the treatment costs for individual units and also minimise the problem of technical know-how and management. Between 1990-2000, more than 90 CETPs projects were approved with financial assistance coming from various sources including the World Bank. Today, the euphoria has ebbed and CETPs are fast becoming the proverbial white elephants. CETPs cost anywhere between Rs 2-20 crore. But this is just the easy part. Because the Union government through projects like the World Bank-assisted Industrial Pollution Control Project subsidises such ventures. The problem is its maintenance. Industries have to share the burden of the running cost, but owners are unwilling to cough up. In Maharashtra, the CETP at the Additional Ambernath Industrial Area has been abandoned precisely due to this reason. "We operate on a small profit margin. There is no way we can undertake the running cost of the plant," says Dhiru Shah, a factory owner. "CETPs have also failed to effectively treat effluents," says Tishya Chaterjee, member secretary, Andhra Pradesh Pollution Control Board. For example, in Tirupur, Tamil Nadu - which is the hosiery capital of India - CETPs are adding to the pollution problem as they have failed to bring down the high levels of total dissolved solids (TDS) in the effluents from the dyeing and bleaching units. In Pali, Jodhpur, the problem has been the changing nature of effluents (see box: Down the drain). Probably frustrated by such failures in cleaning the sector and in face of growing judicial pronouncements and public anger, relocation of industries from urban areas is now touted as a solution for the mess created by the SSIs. But experiences show that relocation simply means relocation of pollution. "If authorities think that merely by relocating they'll be able to solve the problems, they are horribly wrong," says Paul P Appasamy, director, Madras School of Economics, Chennai. Part of the problem lies in the bureaucratic incompetence in managing relocation efficiently. For instance in Delhi, the ham handed manner has meant that the necessary infrastructure is not ready for the relocation of the industries. "The relocation site at Bawana, where only a few of Delhi's industries can shift, is being developed at a very slow pace. How will we survive till then?" asks Y P Suri, vice-president, Delhi Manufacturers Federation. Factory owners allege that those who tried to adhere to the regulations and apply for relocation are the ones facing the brunt. They claim thousands of other industrial units are flourishing illegally under a corrupt regime. Besides, myopic city planning has added to the problem. In 1960s, the Delhi government had shifted industrial units to a newly set up industrial area of Mayapuri, which at that time was on located Delhi's outskirts. Now Mayapuri is a prime residential locality. Residents of Bawana, one of the relocation sites, fear a similar fate. Residents protest such relocation now. "The government is dumping all the dirt of the city here. How are they going to make sure that this place does not get polluted as the filthy industrial areas of Delhi?" asks O P Verma, a resident of Bawana village. The fate of tanneries in Kolkata is similar. 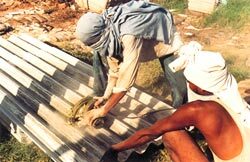 In December 1996, the apex court ordered 550 tanneries located in Tangra, Tiljala, Topsia and Pagladanga in east Kolkata to close shop and relocate to the Central Leather Complex (CLC) in Bantala by February 28, 2002. The relocation site is still not ready.